Provide some info from time to time, but in strict terms. Thus involving members come back to keep getting next content output. So, you create the calendar of new info editions at once and allow lots of people get access to this content. But info is restricted by you in it’s amounts for different members and related to the time being an active member. So with Dripping Content feature you make up the schedule of your membership content and post it with regular intervals. 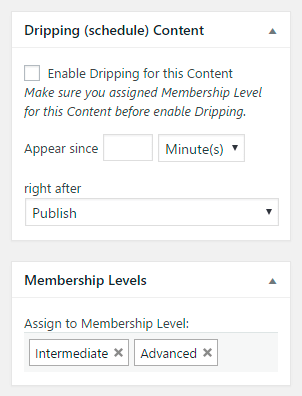 Make sure that you assigned Membership Level for content before enable Dripping feature.